I talk conventions with my BFF on my new podcast, BUSINESS BFFs. Listen here. 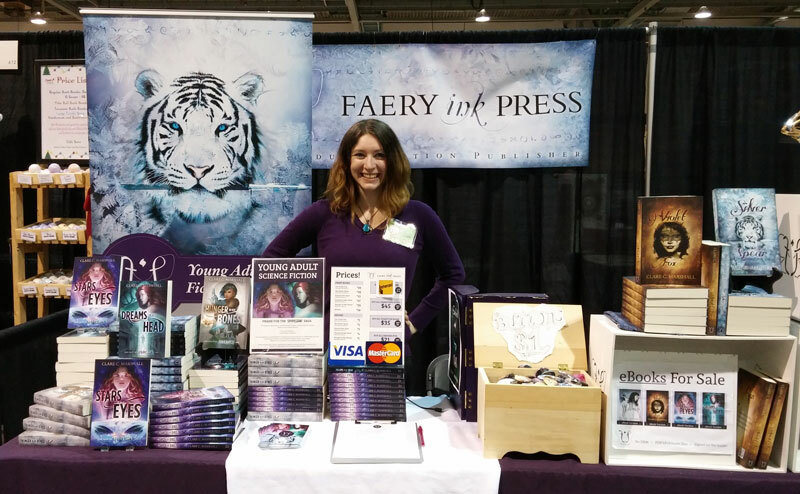 Faery Ink Press participated in the Expo Holiday show last year, but I did not! Jessica Corra-Larter did the show for me while I did Christmas at the Coliseum. So this was my first year doing this show in person. I went in with really high expectations, and had an okay show. For this show, I renewed my space as a vendor, even though I was considering downgrading to an artist alley spot. That meant I got a 10×10 space, which I really don’t need! 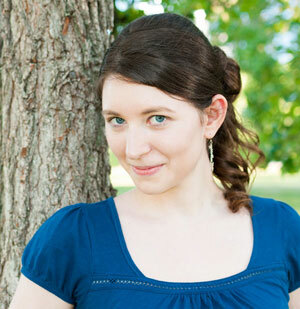 However, my location within the show was closer to the entrance, and I was one of the first authors you could find. I don’t have many Christmas decorations. The items I used at the New Brunswick show last year, I raided my parents’ storage attic for. I went through Dave’s parents’ storage room, and found a light-up Christmas tree. I think the other Christmas decorations exist in a pocket dimension, as they usually appear sometime at the beginning of December. Within the next few years, I’m sure Dave and I will accrue more Christmas bric-a-brac that I can co-opt for holiday shows. I had limited stock for this convention. I’m currently reprinting The Violet Fox AND Dreams In Her Head, and neither of the reprints showed up in time for this show. That was fine, since they’ll be here for Festival of Crafts (hopefully! ), and I figured I had just enough to do this show. With the eight-foot table, however, the display seemed a little lackluster with only “just enough” product. I created a small book spiral/castle display, but once again I underestimated the number of books I have to feed the spiral to make it truly impressive. Also, building it isn’t easy either, as it’s slightly different each time! I also had people straighten the spiral while they were browsing, which I had to fix. The downside of book spirals is that they can be hard on the books themselves – so maybe small spirals are the way to go. I made about $80 less than last year, but otherwise I’m not unsatisfied with my sales. It was a decent Sunday, and per-day, the sales weren’t terrible. It pretty much lined up with conservative expectations for a 2-day con. It’s hard to attribute the cause of the decrease–fellow vendors have complained about the decline in business. It could be the economy. Could be that people are tapped out. It could be that I have the same number of books as last year (removed Within, added Hunger In Her Bones). It could be a lot of things. The only way to combat that is to focus on pleasing my existing audience. At least a dozen people asked me if I had The Emerald Cloth ready yet. April, in April! Just think if I would have had that book – I probably would have met my exceedingly high sales goal. 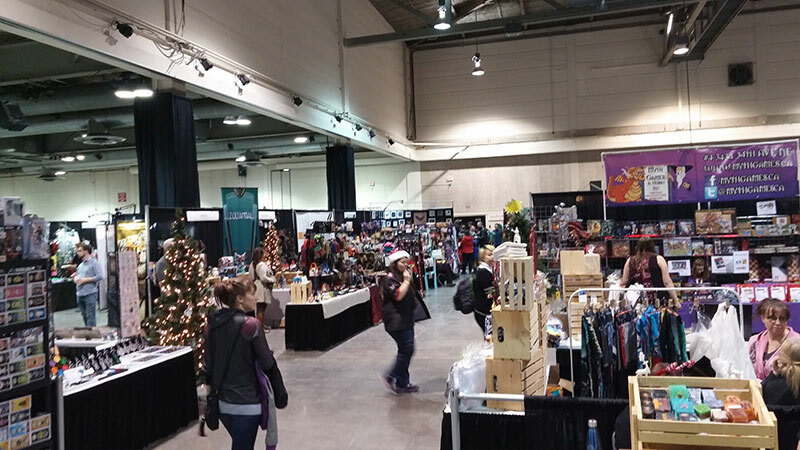 Like I said in my Edmonton Expo post – I need to ramp up my output to keep up with demand. Every convention crowd is different. There were a lot of families, which makes sense, since it’s a Christmas market. I also had a few returning customers say they saw me first at Otafest. People told me they’ve heard of my books, that they saw a Facebook promo I did earlier this year. They stopped by, had a chat, and some of them bought! 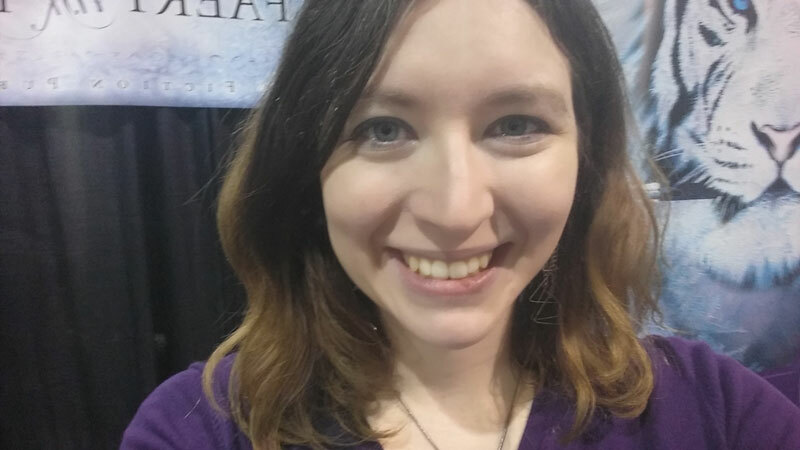 Others approached me because they recognized me from other conventions, and they were finally ready to hear about my work. On Saturday, there was a rush at the beginning, which faded around 3pm. It was dead by 4pm. It closed at 6pm. Even during the rush of people, there was an overwhelming feeling of overstimulation and chillness. People weren’t really interested in interacting. They were worried I was going to pounce on them and sell them something they didn’t want. Which is the last thing I want to do. Also, one cannot “try” to be genuine – you either are or you aren’t. People can sense when you’ve turned them into dollar signs. 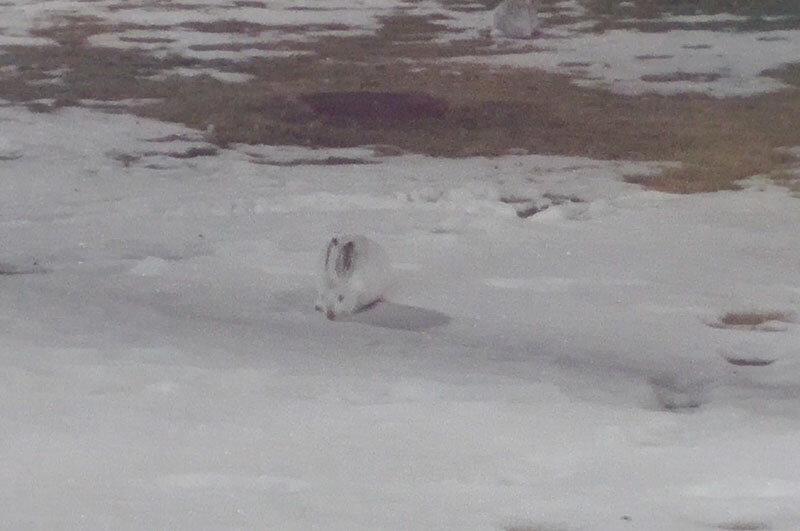 These images were taken around 4:30pm on Saturday. I struggled here – I am naturally friendly, and the best way to sell a book to a new customer is to have a meaningful interaction. It’s really important to respect the potential customer’s wishes, and try to perceive what they need. So I tried to maintain a healthy distance, scaled back on my assertive approach, and trusted my instincts when it came to people’s gaze. If they looked, looked away, and looked back – then I could interact. If their attire suggested they might be book lovers, then I could interact. If they looked for two seconds, and continued on – then they absorbed my brand and decided it wasn’t for them, and it was okay to let them go. That’s hard, because that begins the downward spiral of: “I should have pushed harder with her, she would have at least taken a card, maybe she would have come back.” No, no, no. If the sale didn’t happen, you have to accept that, and move on to the next opportunity. Maybe they’ll return next time. Maybe they wouldn’t have bought anyway–maybe they were caught in the orbit of the pretty white tiger. You can’t dwell on that stuff, because it’s a distraction. You can only learn and do better next time. I sold a lot of Stars In Her Eyes. It could be because of the book spiral, but it also could be that I changed up my pitch slightly. Jessie told me at Hal-Con that people responded really well to a simplified plot explanation, one that’s less than ten seconds. The pitch I’d been using (X-Men with aliens in Northern Alberta) is good, but it’s not enough for most people. I also led with the fact that the series is set in a fictional Alberta town. Sparkstone Saga sets and Violet Fox sets sold about the same. Most people who bought The Violet Fox also bought The Silver Spear, as usual. Nearly 70% of people opted to pay with their card, and more than half of those people paid with debit. Greg and Justin invited me to a ramen supper on Saturday night. Dinners, suppers, and drinks are the funnest part of conventions. There were at least six of us marching from the BMO to a ramen place downtown. I get easily turned around, so I have no idea where it was. As usual I was engrossed in a conversation, this time with Justin, about our past and current convention “expansion” strategy. The ramen, though, was so, so good. I haven’t really had it that many times, but for days afterward it was all I craved. In publishing, it’s the parties, the dinners where deals are often made–but to clarify that, it’s the after-convention stuff where relationships are made. Knowing that there are other people like me, who do what I do, who have the same problems as I do, or have solutions to my problems because they’ve been-there-done-that–it’s a comfort to my solitary, working self. I became better acquainted with Alexander Finbow, the director at Renegade Arts. I also really enjoyed swapping stories with Shae Proulx – it was nice to hear another woman’s perspective on selling your own work. I wished I could have gone to the James Joyce afterwards for more drinks, but I was exhausted and in a food coma, and the train ride is at least 30 minutes back from downtown. On the way to the train, I made two new friends. Can you spot them both? I was also next to Geeky Soaps, a husband and wife team making geeky themed soaps and bath bombs. I particularly enjoyed their pitch about the Sorting Hat bath bombs that, as it dissolves, reveals your house colour. I was also across from a woman selling Sweetlegs. Both of these booths drew a lot of browsers and helped my visibility as well. 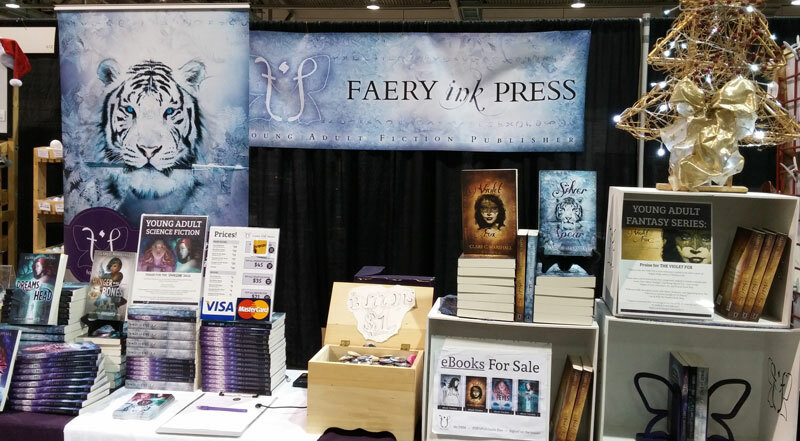 Yes, I noticed the up-tick in authors selling at their own tables as well. Suzy Vadori, Adam Dreece, Katie Barron, Vince Seim, and at least one other person were selling paperback novels. I had a couple of comments about the number of local authors. 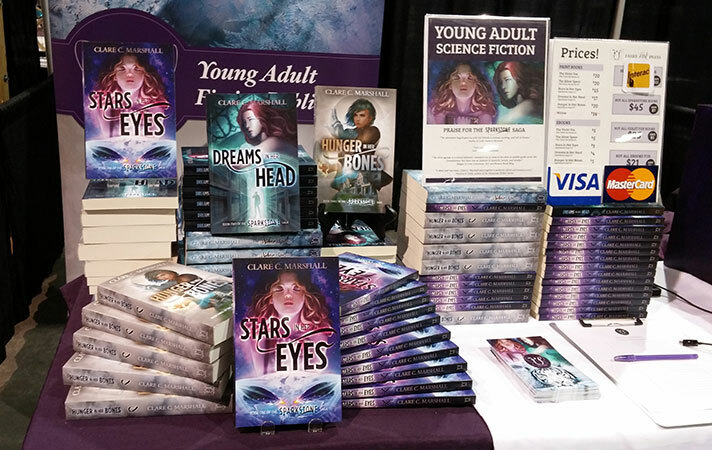 More authors are starting to notice that conventions are a potentially viable market for speculative fiction. And it makes sense for everyone to participate in this market – it’s Christmas, it’s Calgary, and there’s potential for serious dollars here. 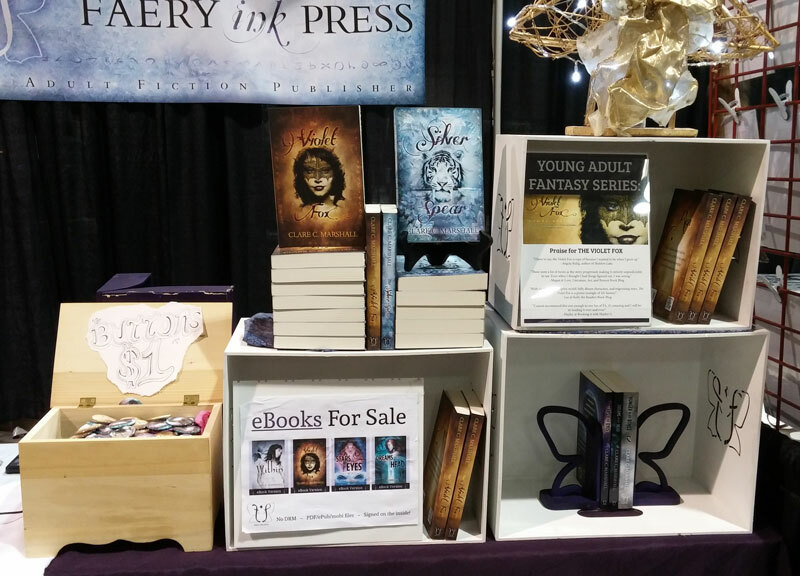 With conventions becoming more expensive each year, however, who knows how long this market will remain viable for books. 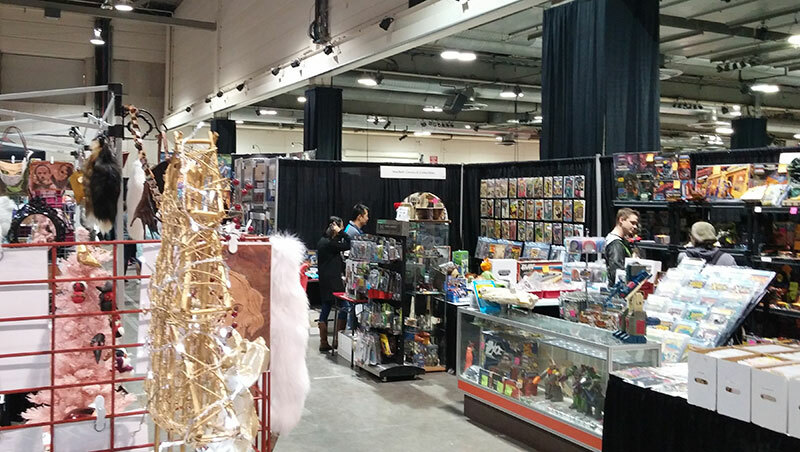 Like I mentioned in my Edmonton Expo write-up, the bigger brands can weather the storm. If you don’t have enough new stuff for returning customers, if you’re unbranded, if your product/brand isn’t attractive enough–that’s where you run into trouble. Every once and a while, I’ll get someone approach the table and emphatically let me in on their secret belief in faeries. This time it wasn’t even a customer, it was a maintenance worker at the end of the day. As far as odd interactions go, these ones are at the fun end of the spectrum. Mostly I am surprised at people’s willingness to tell me, a stranger, their faery theories! I think so – there’s really no reason for me NOT to do this show again, especially since I live here. The spot I had was “reasonable” for the price, but I think I’d try to downgrade to artist alley, just to reduce expenses. The show is still young, after all, even though it’s run by a reputable company with a built-in audience. I’d love to do Christmas at the Coliseum again – and next year I’m probably going to make use of my sister so we can hit as many holiday shows as possible. Aw yeah, proxy selling! 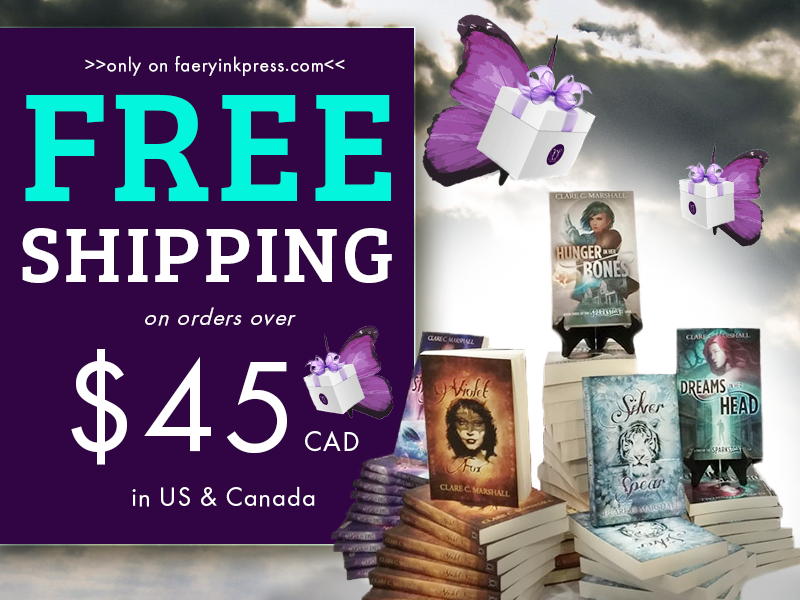 Also….I’m extending my Black Friday sale until the Canada Post cut-off date for shipping (December 11). Free shipping for orders over $45. Yay!